Vegetable Pizza/ Homemade “Vegetable Pizza” is going to delight the little faces at home for sure. Pizzas are enjoyed by children and adults alike and the joy of making the Pizza from scratch is inimitable. Since it is the season of Lent, thought I would put up the recipe for Vegetable Pizza first. The recipe for Pizza base and sauces are same for all Pizzas. So, if you want a non- veg Pizza, you can try with your choice of toppings. 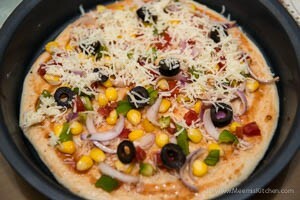 Check my Chicken Tikka Pizza and Paneer Pizza recipe for variety. This recipe is tried and tested many times and so I can assure you that it is very delicious and appealing. 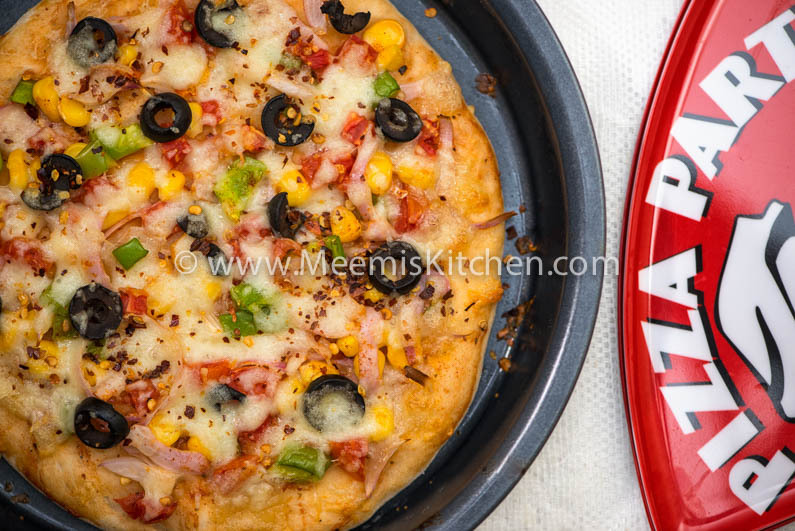 I have prepared this Vegetable Pizza with plain flour/ Maida and to make it healthier you can try with whole wheat flour (it makes the base denser though), to make healthy whole wheat Pizza. The vegetable toppings can be as per your choice, you can mix and match as per your liking. If you get white onions, it is best recommended than the normal Onions. Try capsicum in different colors to make it more colorful. Choose your own yummy toppings from Olives, mushroom, corn, tomato, jalapenos, paneer etc. This vegetable Pizza recipe, helps you to make Pizza from the scratch. The base can be baked earlier for 10 minutes and then take it out and arrange the toppings and bake again or you may go for one time bake, that is together with all toppings and cheese. Make sure that you knead the dough very well to make the base soft and to give it a nice texture. Only lukewarm water should be used. I have added the recipe for making the Pizza sauce at home, from available ingredients. As the kid”s demand and taste differ, try making variety snacks like stuffed Garlic Bread, Sausage Dinner Rolls, Paneer Puffs, Egg Puffs, soft Crescent rolls, Pizza Dosa, Samosas, Potato Croquettes etc. So, add sparkle to those little faces today by making their favorite Vegetable Pizza at home!! Enjoy! Mix the flour, milk powder, baking powder and salt very well. In a cup add yeast, sugar and little Luke warm milk and mix well. Keep aside. Make a well in the center of flour and pour the yeast mix and gently combine. Add olive oil/ Butter and more lukewarm milk/ water to make a smooth dough. Knead for some time, till you can feel that the dough is smooth and soft. Rub little olive oil in your hands and roll the dough into a smooth ball and cover nicely and keep for 1 -2 hours, till the dough is double the size. Divide the dough into three equal portions. Take one portion and make a ball, dust with flour and roll out into a desired round shape of almost half inch thickness. You could also try to press with your palm and make hand stretched Pizza base as well. Allow to rest for 10 – 15 minutes and poke the base with a fork to prevent bubbles. Transfer to a baking tin and keep aside. Roll the other two portion the same way and keep it ready. In a bowl, mix all the ingredients for Pizza sauce and combine well. Chop the vegetables, cook the corn and mix all the veggies (except black olives) with salt, oregano and Paprika. Grate the cheese and keep ready. Spread the Pizza sauce on the base, sprinkle little cheese and spread the vegetables. Top with black olives and cover with cheese. Sprinkle Chili flakes on top and bake in a preheated oven @ 180o C, for 20 minutes or more. The cheese on top should melt evenly. Take it out, cut into triangles with a Pizza cutter and serve hot. Yum.. Yum!! You can choose your toppings of vegetables as per your liking. If White onion is available, use it for better taste. Mozzarella cheese is used for pizza. Always use a good brand. Instant yeast is used in this recipe. If you are using dry yeast you have to keep it for rising in lukewarm water. Only Lukewarm water should be used to knead. If the water is too hot, it will spoil the texture. If your kids like it, let me know and share with your friends using the share buttons below. It would encourage me. Thanks and God Bless! !